two days went by in a blink. But to a bungalow with flowers so pink. And Prerana insisted on being human! Venkatesh, was ever-ready with a pose. in dealing with all the views so radical! Lavender oil spread its perfume. Teneri honey a trifle bittersweet. Made for a composition I'm glad I did not miss. As she brought together disparate strands. But also us opposites, so cleverly juxtaposed. Which give us such joy for hours! Keith Stanley has some useful information and tips on no-kenzan fixtures, using wire, etc. There is a link to a PDF file that gives more detailed instructions as well. Here are the pictures from our exhibition. If any arrangement is missing, please let me know, and I will add it! CHENNAI: Dried plants and tree branches hold utmost beauty to them, while spaces, lines, mass and surface are important features of their arrangement. Students from the Sogetsu School of Ikebana showcased their creativity in the Japanese art of flower arrangement, which was inaugurated by Bharatanatyam exponent Alarmel Valli at the Lalit Kala Akademi here on Friday. The three-day exhibition is being organised as part of the Japan cultural festival by ABK-AOTS Dosokai, Sogetsu Study Circle in association with the Consulate General of Japan. In Meenakshi Sarin's arrangement Asia lily, ginger lily and aesthetically cut cane swirls merged to stand out in a ceramic vase. Ambika Chandrasekar went a step further by making her exhibit eco-friendly. Eucalyptus leaves took shapes when arranged on the recycled paper basket. Besides learning a new hobby, participants said how the art has helped them add a new dimension to their personal and professional life. 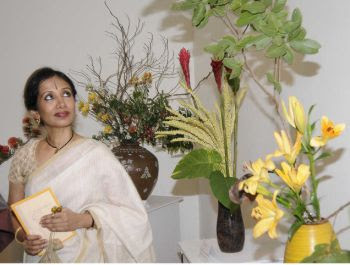 Ashoka Bhupathy who has a boutique is among the few men who have been learning Ikebana from Malathi Pandurang. “In my store I match a new outfit with the arrangement. It stands out as well as brings in more curious customers,” says Mr. Bhupathy, who makes a new Ikebana style every three days. Chitra Thyagarajan has completed her basic and advanced course in Ikebana and says the art makes one explore further, even when driving. “I have around 25 ceramic, glass and other containers at home where I try different arrangements. It is the beauty and joy that this art brings out for the entire household,” she says. Others like Seethalakshmi Asaithambi specially placed order for a granite vase to coordinate with her flower arrangement. Earlier Alarmel Valli recalled her memories of Japan, her association with Malathi Pandurang and how Ikebana, dance and poetry come together. As you wait for me to upload the Ikebana Chennai photos, enjoy this set!